D23’s Destination D event just announced that Pinocchio will be joining the Walt Disney Signature Collection on January 10 in Digital HD, Blu-ray and DVD formats. Class bonus material as well as exclusive, new features have been promised. Included will be artwork and archival recordings of Walt–the man–during the Pinnochio’s production. Additionally, a new rendition of “When You Wish Upon a Star” from Disney’s Maker Studios rounds the bonus material out. We were just treated to the new trailer, and the remastered footage looks more beautiful than ever. Disney fans will be sure to love this classic film as much as they ever did, if not more. VIDEO: New ‘Rogue One: A Star Wars Story’ TV spots showcase new footage! Interesting how it’s part of the ‘Signature Edition’ line-up’, but it wasn’t included in the ‘Diamond Edition’ line. I’m glad that fans who didn’t get the Platinum Edition Blu-ray can now buy this one. 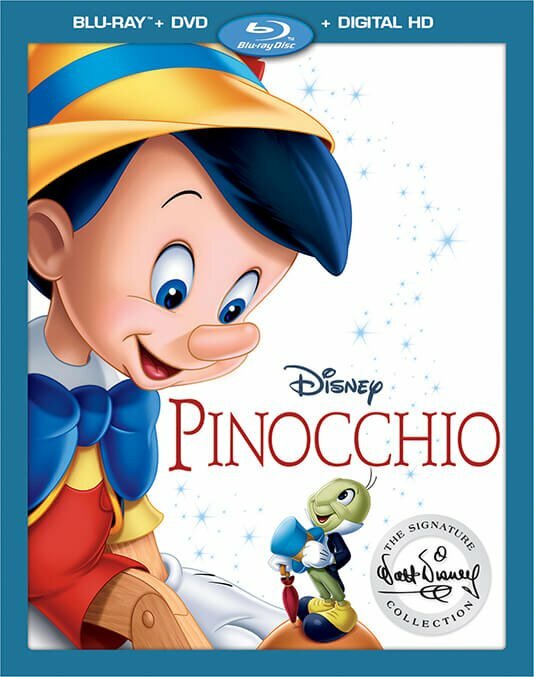 When the “Diamond Edition” came out in ’00, Pinocchio was still one of the infamously crappy “Limited Editions”, and still available. Didn’t come back until its seven/eight year rotation with the Platinum Blu-rays. Still smarting over buying the whole animated series on VHS. Just not worth it. BTW: 4K televisions are quickly becoming the norm. You need to buy new media soon. This means 4K Disney movies. Prepare your wallets. (Snicker!) Yeah….4K TV’s “quickly becoming the norm”. Don’t you “love” the way nobody can figure out WHY DVD and Blu-ray caught on, and keep guessing?